Old school is the best way to describe Chez Nick when you walk in. You can tell that you are walking into a part of history. The place looks like a touch of and old diner while still kept neat, tidy and not dated. There are certain interesting things to see at the short order desk that remind you of a time long ago but it’s not a museum. The menu is a basic one pages that covers most classic items. There are also some off menu items and a regular lunch menu you can order from that might help you out if you are vegan. The menu is broken down into a couple sections such as: omelets with 9 choices ($8.25-$11.75): one choice of either French toast or pancakes ($7.50) with options on what meat you can add to the side for a little over a dollar extra and a coulis option for $2 extra. There is a classic eggs section with one egg ($4.75) or two ($7.25) and for an extra $2-$3 you can add sausage, bacon, salami or smoked meat. There is also a feature section with 5 options ranging from $9.50 to $10.50, some of these items are healthy choices such as granola fruit and yogourt ($10.25) as well as more classic egg and pancake combos ($11.50); and lastly breakfast sandwiches ($9.95-$10.50). 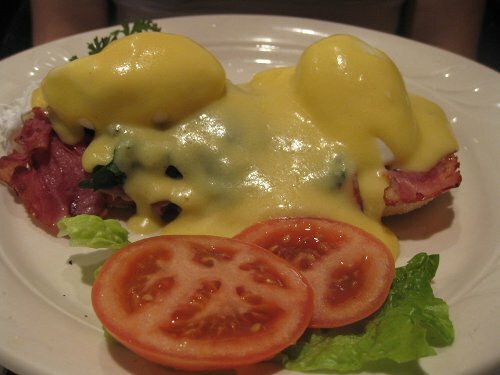 There are also eggs Benedicts which are off the menu and made if the chef has a fresh hollandaise sauce ready that day with choices and prices ranging around $10.95. We began by having some pancakes which came with 3 sausages all for $8.75 (without the meat it is $8.50) which is an ok price but borders on a little more than what you would pay elsewhere. The taste of the pancakes though made the price seem relevant. They were fluffy yet filling with a golden glow to them and when I say filling I mean really filling; it took me a while to finish them and I was stuffed at the end of it. 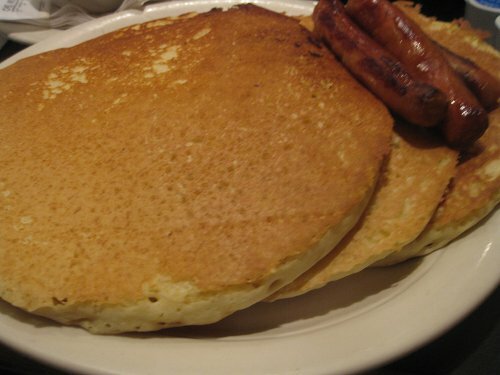 The plate came only with pancakes and sausage and I would have liked to have some fruit or potatoes included in it even as window dressing, but don’t let this criticism diminish the fact that the pancakes were a hit. My friend had the Portebello eggs Benedict with a custom addition of ham (10.95). The dish does not usually come with ham but they included it at no extra cost which is quite nice. 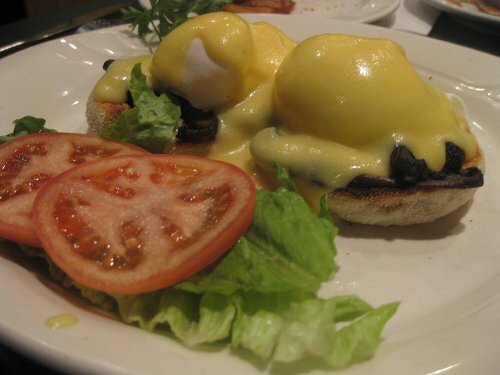 The eggs came served on nicely toasted English muffins topped with a delectable hollandaise sauce which was made fresh that morning and it was out of this world. Arguably one of the better hollandaise sauces I have had in a while. The ham was also nice and slightly crispened and not like those other rubbery hams that are hard to chew. The dish came with a tomato and lettuce and this is really unnecessary since potatoes or fruit would have been a better option. 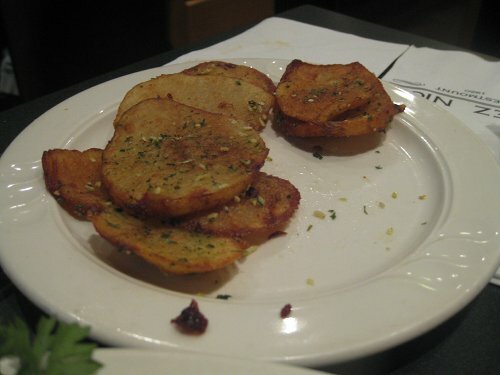 Now comes the potatoes ($2.25) and this is where I hand off the review to my potato expert Batàta and his thoughts on the potatoes: If you like Greek fashion sliced instead of diced fries then, these fries are for you. A great mix of salt/spices with just a hint of lemon juice will leave you demanding for more. This is especially true since I believe that the quantity of fries given as a side for $2.25 should be more. I give it a 3.5 out of 5. Our waitress was really great as she was friendly and helped explain the menu and explained that the eggs Benedict were not on the menu and we had to ask for them separately. This was a big bonus to us since we were craving some. Our coffee refills were also very frequent and our bill arrived just at the right time. The menu is very vegetarian friendly and the meat is actually an option on some dishes which allows you the choice as opposed to other places where you are locked into an item and have to hope that they can hold the meat. There is also a lunch menu you can order from that has salads and other vegetarian options which is a nice option; although, those items aren’t really what you would call brunch but if you are vegan then their salad is a legitimate option. The menu is not huge but covers all the bases and definitely delivers in the taste department. I feel the prices are just a little more than they should be but at the end of the day it is worth it considering each dish did not disappoint. One thing I would suggest is maybe including some fruit and potatoes with the dishes as opposed to lettuce and tomato, as well as offering a larger quantity of potatoes on the side. 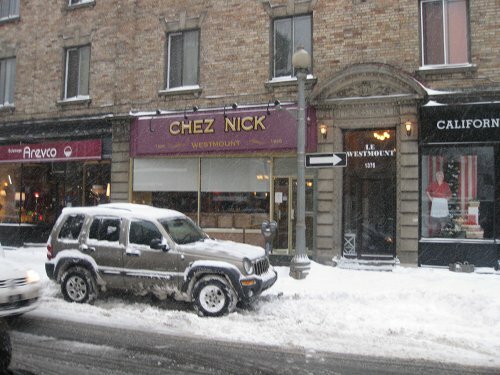 I was quite satisfied by Chez Nick and could see myself coming back again soon.